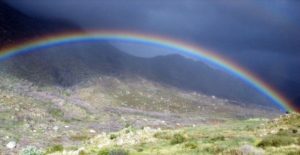 What is the concept of the rainbow that was newly created after the Flood (the sign of the covenant)? Now it is known that the rainbow is a natural phenomenon that occurs when the sun shines from one side of the firmament, and on the side opposite it there are clouds. Through this process the colors of the rainbow are seen in the clouds. This will be understood by first explaining the concept of a cloud (about which it is said “I have set my rainbow …”) in spiritual terms. The concept of a cloud in spiritual terms has two levels [one positive and one negative]. The positive concept of a cloud, on a very high spiritual level, applies when spiritual revelations are shining from such a high level that is impossible for us to receive them [because of our limitations]. Because of this, we need a screening “cloud” through which we will be able to receive the revelation. This can be learned from the verse, “For a sun and a shield is Havaye Elokim [the L-rd G-d] (Psalms 84:12).” [These two Divine Names denote two manifestations of G-dliness. The Divine Name Havaye is a transposition of the four letters of the unutterable Divine Name that refers to unlimited G-dliness which transcends all the created spiritual levels. The Divine Name Elokim refers to the G-dliness which is contracted, enclothed and concealed within the spiritual and physical worlds, in order to enliven the creations within them.] Just as it is impossible to look at the sun without a screening shield, so it is impossible to directly receive the revelation from the transcedent level of the Name Havaye, except by way of the screening shield of the “covering” of the Divine Name Elokim. And just as there are these two levels in the spiritual types of cloud (the level of the cloud which reveals, and the level of the cloud which hides and conceals completely), so too in the physical clouds there are two types. There are light clouds through which it is possible to look and benefit from the sun, even if only for a moment. And there are clouds that darken completely, about which the sages say “a cloudy day is as hard as a day of judgement,” because they are the level of judgement. And through this one can understand the concept of the rainbow that was newly created, specifically after the Flood. Before the Flood the world was not purified. Therefore the clouds were of a type which the sunlight could not penetrate, so the sun was not able to be seen through them. Therefore, it was not possible to produce the colors of the rainbow before the Flood. This was not the case after the Flood, through which the world was purified. The clouds became lighter, and the light of the sun was able to be seen through them in the colors of the rainbow. This type of cloud, which is for the purpose of revelation, also teaches about the concept of repentance. It is similar to the cloud of the smoke of the incense of Yom Kippur [when it was brought during the times of the first and second Temples], that come through the repentance of Yom Kippur. This same concept can be seen in the simple meaning of the cloud described in Genesis 2:6, “There rose up from the earth a mist, etc.” The [original] cloud (mist) came from the [lowly] earth. This is also the concept of a cloud in spiritual terms: [the opportunity for a revelation of the concealed levels of G-dliness] is provided by the service [of mankind] below, the service of repentance. As it is known, there are three “atmospheres” between the sun and the Earth. The atmosphere closest to the sun is the intense heat, and the intermediate atmosphere is the intense coldness [empty space]. In the atmosphere [of air] that is lowest (closest) to the Earth, [the sunlight] is spread out in a greater intensity, because it [the sunlight] is not able to spread further into the ground, and it reflects and returns from the ground. This is the level of the returning light, which corresponds to concept of the service of repentance [which is directed from mankind “below” towards G-d “above”]. Through the service of repentance that is a level of “returning light,” a [spiritual] rainbow is created that has within it three (primary) colors [which correspond to G-d’s “primary” attributes of Kindness, Judgment and Mercy]. This concept [teaches us] that the service of repentance needs to be in these three ways of Kindness, Judgment and Mercy… Through repenting here below in these three ways, we draw down from above the rainbow [of G-dliness] with the three (primary) “colors” that are in it: Kindness, Judgment and Abounding Mercy. Through this, the three basic powers of spiritual impurity in this world are nullified, as it is written, “I erased like a thick cloud…” (Isaiah 44:22) [Thus the impure powers] are completely erased, in a way of purity. And this is what is written, “This is the sign of the covenant etc., … My bow I have set in the cloud.” Through the service of repentance, the level of the “higher cloud” is created, so that the clouds bring all the blessings: “And I will give you your rains in their seasons…” (Deuteronomy 11:14) This comes in the way of a covenant that “All the days of the Earth, planting and reaping, cold and heat, winter and summer [all the seasons of the year] will not cease” (Genesis 8:22). And in addition to this, it says “I have placed My rainbow in the cloud.” Within the concept of a rainbow that is able to exist by way of a cloud, there is a spiritual concept that is higher than all the blessings that are drawn down through the [revealing] “cloud” [that is produced by repentance]. “My” rainbow is a phenomena that is close to “Me” [G-d], because this aspect is greater than all the revelations since it is close to “Me,” that is, to His Being and His Essence, may He be blessed. And just as it is written, “As the vision of the rainbow that is in the cloud etc.” [Ezekiel ch.1, referring to the prophet’s vision of the radiance surrounding G-d upon His throne], it is a vision of the form of G-d’s glory. Even this is in the way of a covenant: it is the concept that a covenant is something that unites the partners that “pass between the pieces,” to actually be passed between one body, so that the several actually become one. And from this will be understood what is written in the Zohar, “Don’t expect the footsteps of Moshiach until you see a rainbow shining with bright colors.” This is because the concept of the rainbow teaches about the service of repentance, as explained above. It is also because [the rainbow teaches us that the repentance] should be in all the three ways [Kindness, Judgment and Mercy] that are hinted to by the primary colors, as explained above. Therefore [when you see people turning to G-d in repentance], you can look forward to the footsteps of Moshiach, because Moshiach is the concept of repentance. Moshiach is destined to bring [even] the righteous to repentance. Through revealing the spark of Moshiach that is in every righteous person, which is the concept of repentance, the general Moshiach will be revealed. [The rainbow teaches us] that through our deeds and service in the time [before Moshiach] in general, and specifically through learning these concepts in Torah, there will be a “remembering” Above of the [entire] Covenant of Noah. … And through this, we will very soon merit … the coming of our Righteous Moshiach. [And this explains the statement] that when the colors of the rainbow are bright, we need to anticipate the footsteps of Moshiach, specifically in the time of “the footsteps of Moshiach,” until it will be “[one who comes] with the clouds of Heaven” [Daniel 7:13]. And now we need to anticipate the footsteps of Moshiach that will be very soon… While it is still approaching the “Sabbath” [the eternal Messianic Era], we need to taste from the “dishes” [the teachings of the inner dimensions of Torah] that are prepared for the future… [With this] we will very soon merit the True and Complete Redemption with the clouds of Heaven, through our righteous Moshiach. As published in Sefer HaMa’amarim 5743, Brooklyn, NY. Furthermore, as quoted in Tanya, Book 2 (The Gateway of Unity and Faith), Chapter 1, the Baal Shem Tov explains that creation is not a one-time event of the past, but a continuous process. At each moment, G-d is bringing our existence into being anew. This concept is explained at length in Tanya, Book 3 (Iggeret Ha’Teshuva), Chapter 7.